Waco was deep in the heat of Texas on Monday. The city -- home to Baylor University (and the HGTV show “Fixer Upper”) -- just logged its hottest day on record with temperatures reaching 114 degrees Fahrenheit (46 Celsius). The reading smashed the old mark of 112 for the area between Dallas and Austin set on Aug. 11, 1969, said Ted Ryan, a National Weather Service meteorologist in Fort Worth. What’s even more surprising is one of the major reasons for the record heat: a cold front. Yes, you heard right. Ryan said a cold front moved to the north of Waco and, as is often the case in these situations, the winds died right in front of those cooler temperatures. The fact that it came in the middle of a once-in-a-decade Texas heat wave that has been scalding the state for days just sealed the deal. 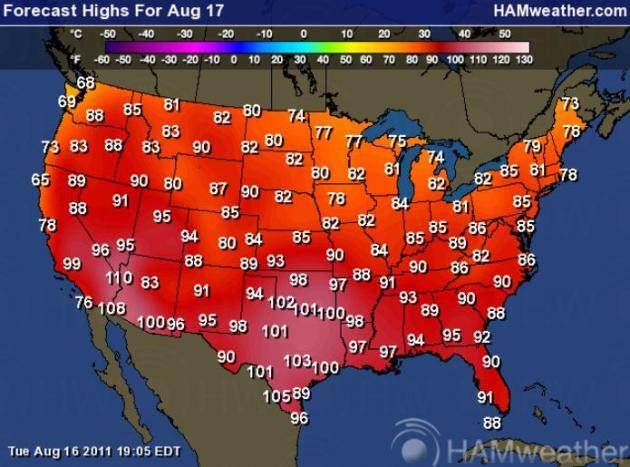 “This is an unusual heat wave for Texas,” Ryan said. I didn't think we'd actually hit the predicted 109 F yesterday, but apparently we did. I did not go outside during the hottest time of day, so it seemed about like the rest of the week from what I experienced. Hot enough, for sure, but not bad enough to kill anybody around here unless you were staked out on an ant hill somewhere. I'm getting ready to experiment with some dam building soon, since the creek is completely dry. In spite of all the negative feedback, I'm going to build a small check dam with bags of concrete. Very fast build, and if necessary, I'll plaster over the joints after it's built. I have a water tap close by, so I will wet the sacks as soon as I lay them. I recently floated the Guadalupe, and I saw lots of retaining walls built this way, and they look as solid as poured concrete, to me. If I get the dam built and it looks good, I'll fill the new pool with well water for a preliminary test. Quikrete is $2.59 for an 80 lb bag if you buy a a pallet (42 bags), and I can pick up a pallet at a time with the flat bed. My rough estimate is that it'll take about 200 bags for the basic check dam. I know my back will hate this job. I think I can actually drive the trailer down the creek bed now to the location, so I will only have to lift each bag one time. Set up a vidcam on a tripod by the creekside and make a vid!